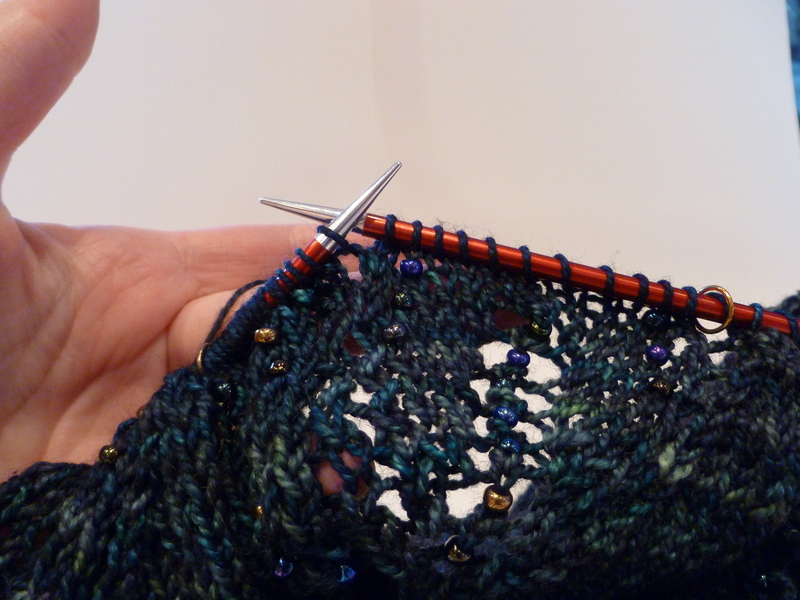 I still haven’t gotten good pictures of the finished Haruni Shawl, but in the meantime, let’s talk beads and knitting. Haruni was my first shawl with beads. The original pattern didn’t call for beads, so I drew up my own version of the chart (which I had to do anyway because of my other modifications to the design) and marked where I wanted to place my beads. 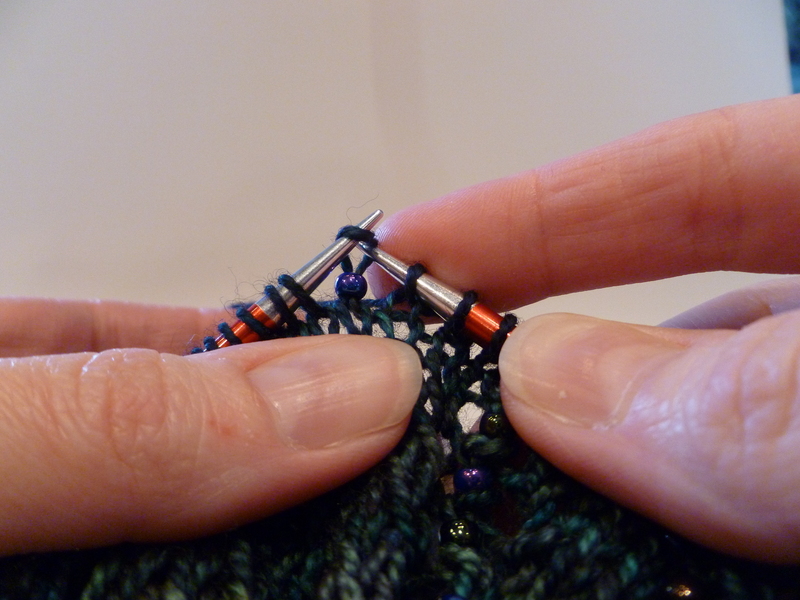 I knew there two basic ways (with loads of variations, of course) to place beads on your knitting: Stringing all the beads first, and placing the beads as you go. The first method sounded like a lot of work, and (depending on how the pattern is designed) sometimes the beads can migrate to the back of the work, negating all that effort. 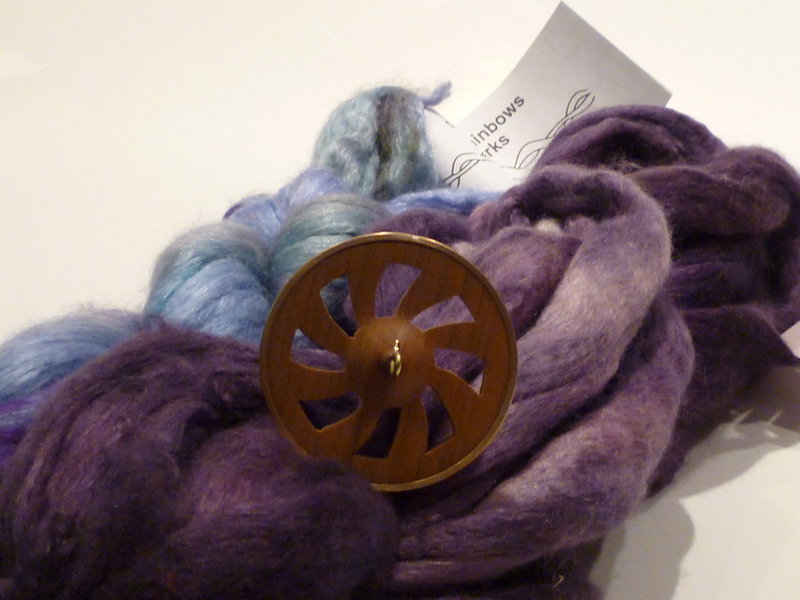 It also causes extra wear-and-tear on the yarn, but since I was using a tightly-spun sock yarn, I wasn’t as worried about that aspect as I would have been if I’d been using a laceweight cashmere yarn. 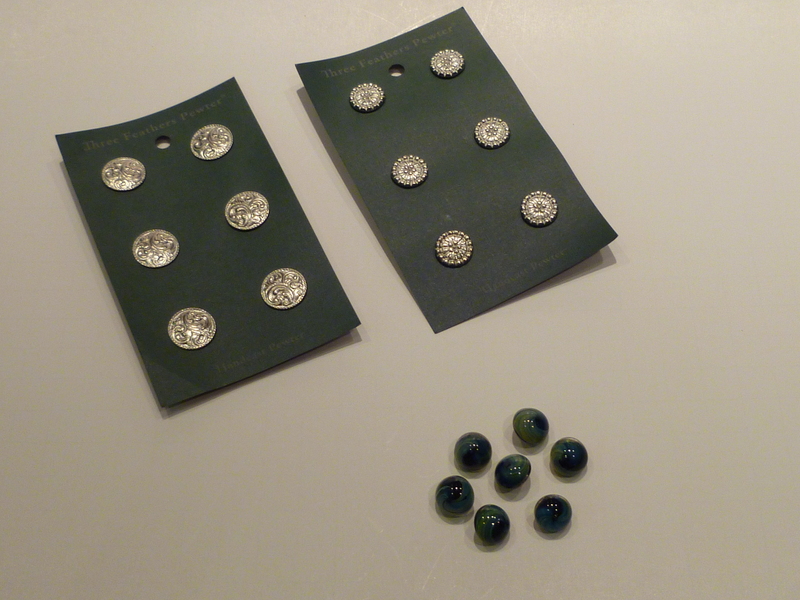 The second approach, which is the one I opted for, was to place the beads as you go along. This can be done with a piece of orthodonic dental floss or with a tiny crochet hook. I tried both and found the crochet hook to be slightly easier to work. Plus, since I was using multi-colored beads, it gave me the flexibility of being able to select each bead individually so I could avoid placing two identical beads right next to each other. I also liked the fact that I could place a bead, then knit the stitch, so even if I dropped a stitch, I was less likely to lose the bead. 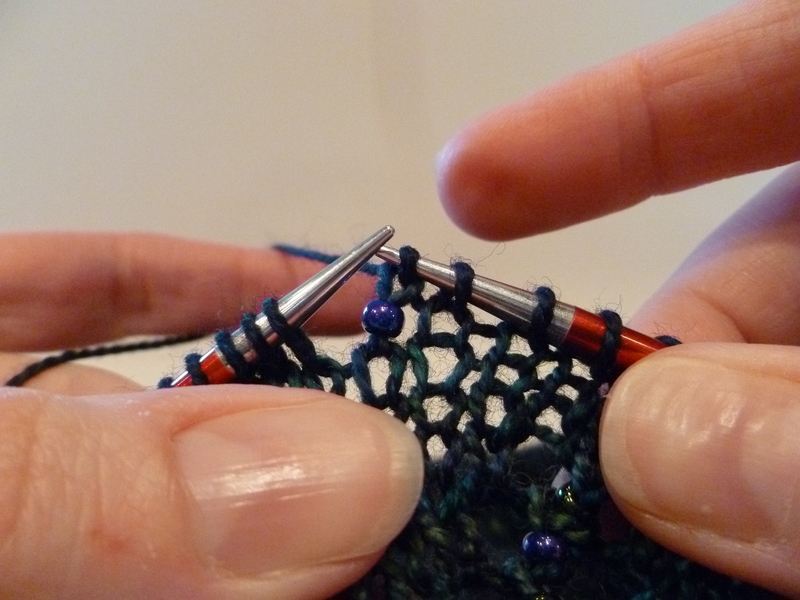 Scoop up a bead with the tip of the crochet hook. Turning the hook so that it faces up, insert the hook purlwise into the next loop on the left knitting needle and pull the loop off the needle. Using your finger, slide the bead down the hook and onto the loop of yarn, making sure that all strands of the yarn pass through the bead. 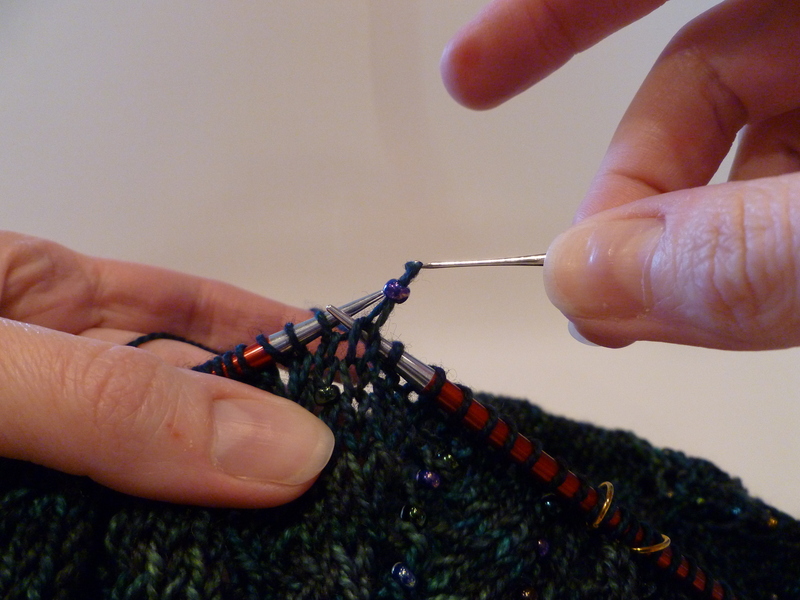 Once you’ve knit the stitch and dropped it from your left needle, you can push the new stitch fully onto the right needle. 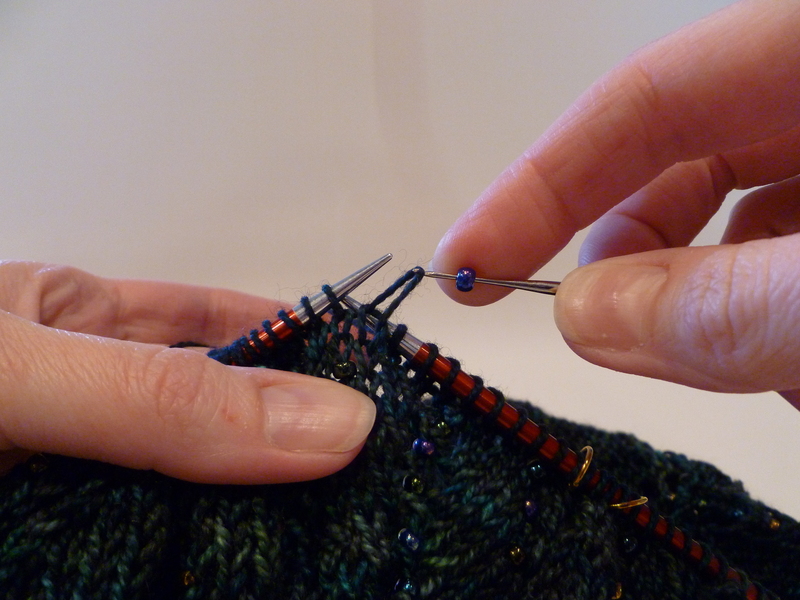 Admire your knitting and your pretty beads! 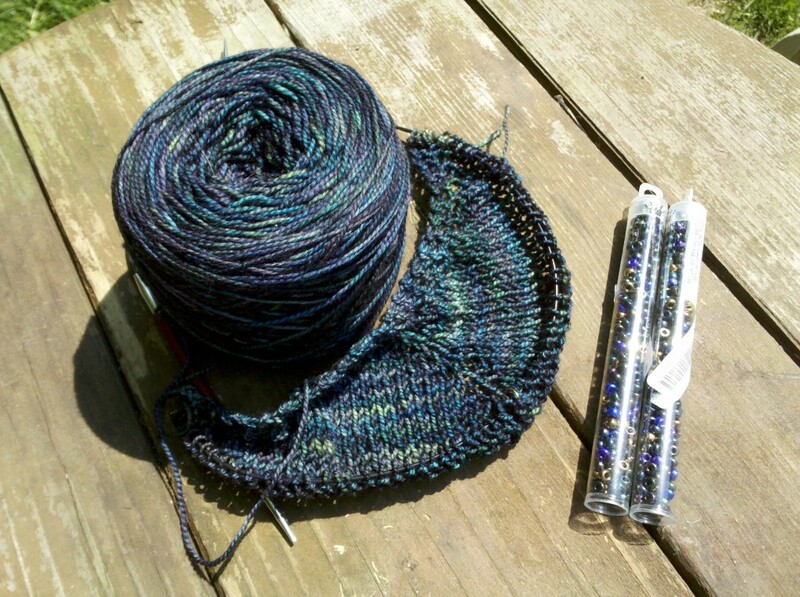 What projects have you knit with beads? What technique did you use? Any suggestions for me? 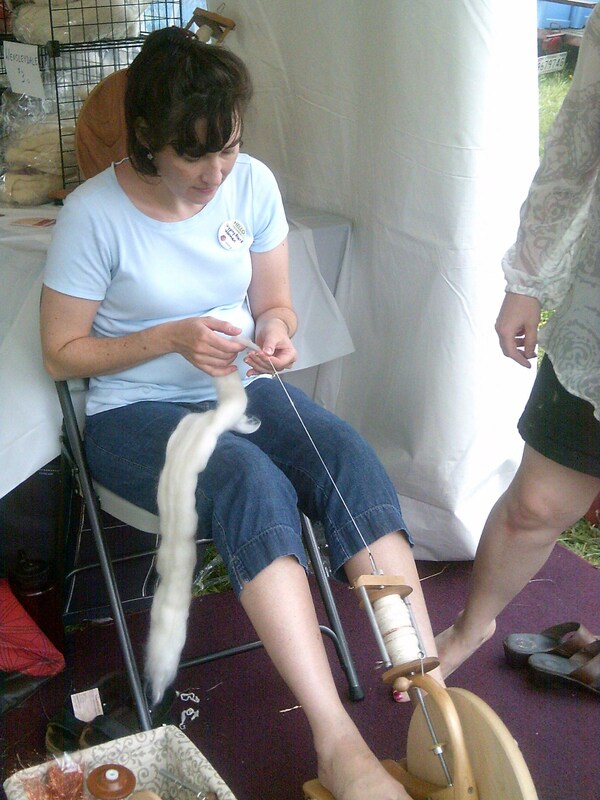 Here I am fondling some yarn in (I think) the Cloverhill Yarn booth. Note Hope’s amazing Fair Isle vest! She was stopped repeatedly by people wanting to admire it. One woman told her it was as good as the first place entry in the show! So… what did I get? 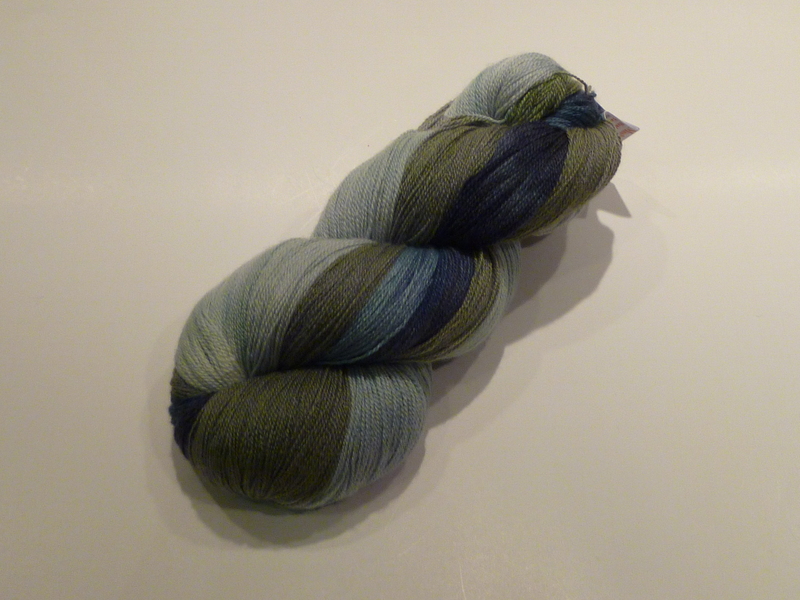 Three skeins of Minerva (50% merino, 50% bombyx silk) from Spirit Trail Fiberworks, colorway Storm Clouds. Sweater pattern to be determined soon! 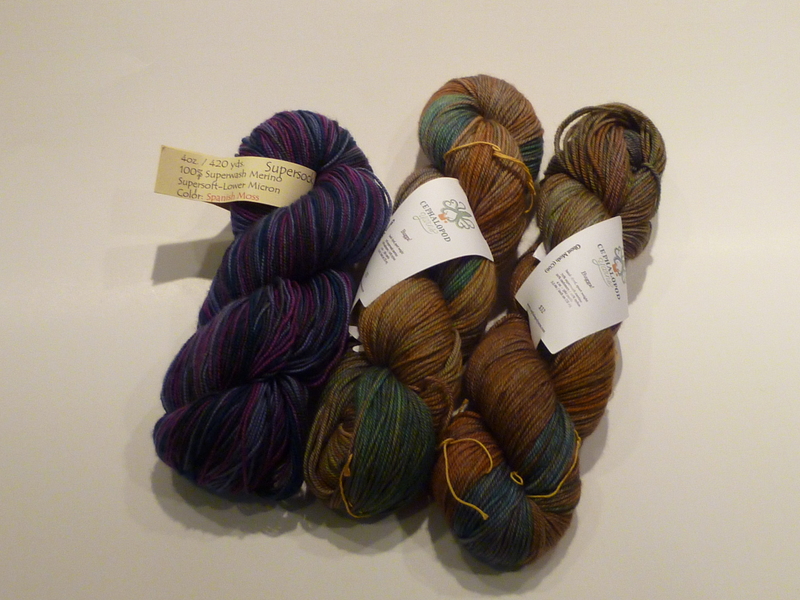 Two skeins of Bugga! from Sanguine Gryphon, in Sooty Dancer and Prostetnic Vogon Jeltz (gotta be a Douglas Adams fan to get that one; I might have bought it just for that!). Buttons from Jennie the Potter (blue) and Melissa Jean (green). 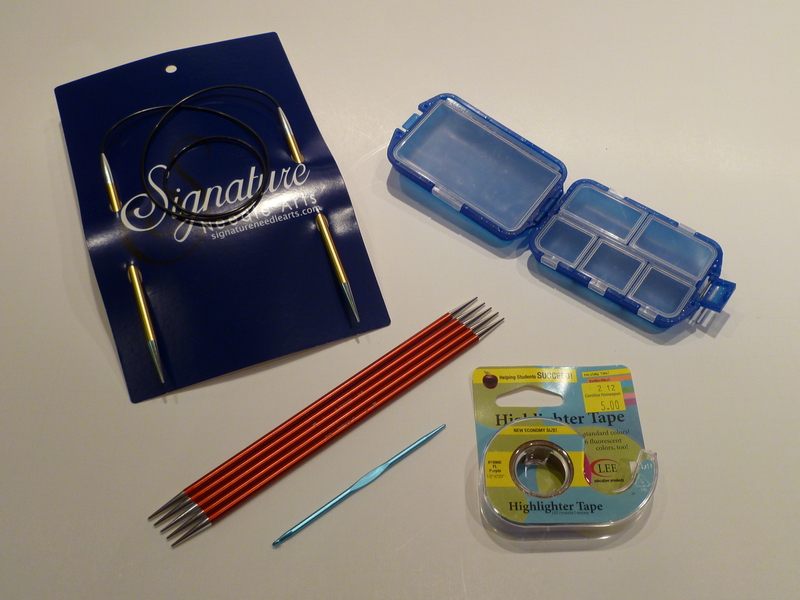 And new knitting needles (circular and double-points) from Signature Needle Arts (which aren’t in this picture because I already put them to use!!). 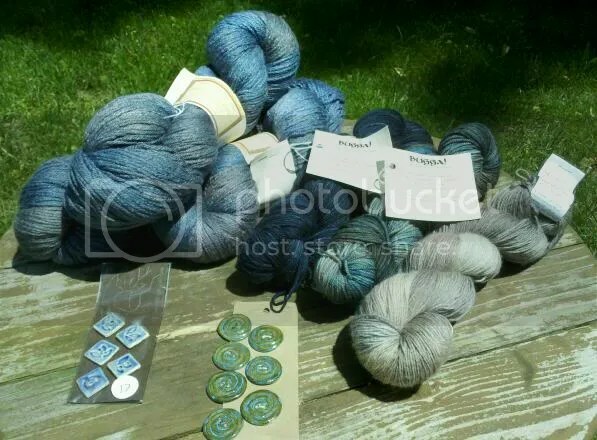 I spent Mother’s Day sitting in the backyard with my feet up, working on a new project (which I cast on entirely as an excuse to use the aforementioned new Signature circular needles, which are an absolute dream to use). If you’re a mom, I hope you spent Mother’s Day relaxing and indulging in one of your favorite interests (and/or chocolate!! ).